Two images show a human effigy pipe created by the prehistoric Adena culture, which lived in the Ohio Valley between 800 B.C. and 100 A.D. In the first image, taken during excavation of Burial 21 of the Adena Mound in Ross County in 1901, the pipe is in the ground, partially covered. In the second image, the details of the tube pipe are visible. Made from pipestone, it is in the shape of a man standing upright, wearing typical clothing and jewelry--a headdress, earspools, and a bustle on the back side. 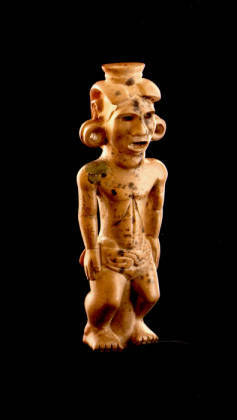 The pipe, which is also called Adena Man or the Adena Pipe, measures 1.97 by 2.60 by 7.87 inches (5 by 6.6 by 20 cm). As of 2013, it is recognized as the state artifact of Ohio. File Permissions for use of this photograph: Online access is provided for research and education purposes. For rights and reproduction requests or more information, go to http://www.ohiohistory.org/images/information. Adena Culture, ca. 800 B.C. to 100 A.D.